Efficiency is key when it comes to air conditioning. You don’t want your energy bill to be any higher than it needs to be. An AC tune up will go a long way to improving the efficiency of your air conditioner. And if you are not already, you should have a tune up done yearly to keep your air conditioner running efficiently. Routine maintenance will also help to avoid break downs and repairs. What time of year should a tune up be done? The best time to have a tune up done is before the weather gets hot. In most cases that would be early springtime. Its best to make sure the system is going to run well the first time you need to turn it on. And you will save the most on energy costs if the system is running efficiently for the entire hot season. Most heating and air conditioning companies offer a combined service package that includes a check of your heating system in the fall and your air conditioner in the spring. What will a tune up consist of? 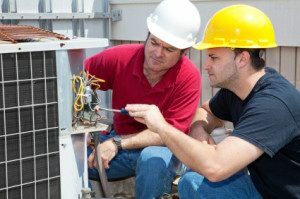 Technicians have a checklist they follow to check all parts of an air conditioner. The evaporator coil will be thoroughly cleaned. Filters will be changed or cleaned if not disposable. Electrical wiring and components will be reconnected and tightened. Condensate drains will be checked and cleared if there are any blockages. Thermostats will be checked to be sure they are working properly. Refrigerant levels will be checked and refilled if necessary. All moving parts will be thoroughly lubricated. The ductwork will be checked for blockages and leaks. The blower will be checked and cleaned. A few other minor checks and balances will be done to ensure the best performance from your air conditioner. How much will a tune up cost? Most heating and air conditioning companies offer an annual maintenance package that includes two tune ups; one in the fall for your heat and one in the spring for your air conditioner. The fee depends upon the maintenance package you choose. The advantages of maintenance packages include reduced repair fees and priority service to name a few. The cost varies from one company to another, but whatever the fee, routine maintenance will save you money. You will save money on energy by keeping your air conditioner running efficiently. You will save money on repairs because your system won’t need repaired as often, and if it does, the fee you pay toward your maintenance plan will reduce your repair costs. The benefits of an AC tune up are endless. Choose a reputable HVAC company to perform your routine tune ups. In Greensboro, that company should be Berico Heating and Air Conditioning. Berico has provided heating and air conditioning service to Greensboro and the surrounding area since 1924. Berico technicians have the training and experience necessary to give your air conditioner a complete tune up that will keep it running properly and efficiently.